The following recipe is from Fire in the Triad competitor Chef Travis Myers from River Birch Lodge in Winston-Salem. It's time for more dessert for your sweet tooth. During Battle Moonshine, this was the first dessert presented. Even though the following recipes are not absolutely soaking in moonshine, no one said you can't take a swig or two three from the jar while making these shortcakes! 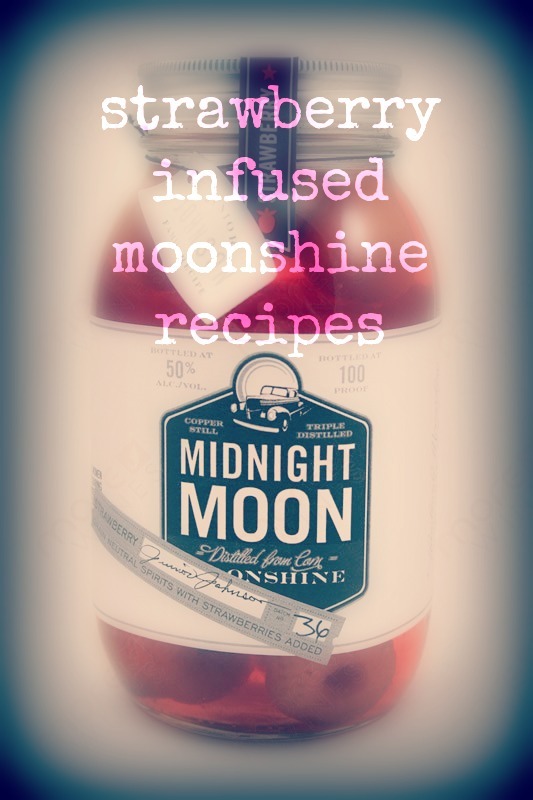 Junior Johnson's Midnight Moon Moonshine is handcrafted in small batches, distilled to be very smooth and infused with real fruit. And 100 proof. But 100% delicious. I'm a sucker for anything with a biscuit. The biscuit for this strawberry shortcake are so crusty on the outside and fluffy on the inside, you'll instantly fall in love (just like I did). If you're a regular reader, you already know I'm quite the biscuit aficianado. After biscuits, ice cream is also one of my favorite things. A flotilla island in the center of an expertly executed crème anglaise, the biscuit was soft, tender and everything you want to love about a homemade biscuit. The strawberries in the sorbet, the garnish and the sauce are a great start to a great summery dessert. Again, this recipe is labor intensive. The recipe has multiple components and was developed for restaurant use. NOTE: The creme anglaise, as pictured, can also be made into an ice cream. After creating the base, follow your ice cream machine's directions to freeze the creme for ice cream. Dissolve the yeast in the warm water, let stand for 5 minutes, then gently stir. Combine flour, baking powder and soda, sugar, and salt, then sift. Cut the butter into the dry ingredients until mixture resembles pea size pebbles. Add the yeast liquid to the buttermilk, then add this to the dry ingredients. Stir until mixture comes together into a dough. Slightly knead. Do not over mix. Dust the work space with flour. Roll the dough gently into ¾ inch in thickness. Cut into 2” circles. Lay each biscuit side by side on oiled sheets trays. Allow to proof slightly (covered with moist towel) in a warm place for 20 minutes. Process in an ice cream machine according to the manufacturer’s directions. Pack into storage containers and freeze for 3 hours or overnight. 1 cup strawberries, cut in half, tops removed. -Combine all the ingredients in a large saucepot. Cook on medium-high heat until mixture has reduced by half and coats the back of a spoon. -Cool completely, gently smash berries, strain strawberry pulp and seeds out of the mixture. -Transfer to a container, cover and store in the refrigerator overnight. Bring milk and cream to a simmer in a large saucepot with a pinch of salt and 1/3 of the sugar. Cut open the vanilla bean pod and scrape the seeds into the pot. Add vanilla pod, remove pot from the heat and steep for 10 minutes. Remove vanilla bean pod. In a small bowl, whisk yolks and the remaining sugar. Temper hot milk into egg mixture: Add half of the hot cream mixture into the egg yolks, stir, and then add all of the egg yolks back to pot. Cook the mixture on medium heat, stirring continuously until the mixture coats the back of the spoon. Use a mesh strainer and pour the mixture through it, into a clean container. Place plastic wrap on the surface of the cream and set in an ice bath to chill. Allow to chill for 1 hour, stirring occasionally. Use your ice cream maker and follow the manufacturer's directions after the cream has cooled. Thank you, Amy! I love your mini bean paste buns!